This light-weight formula goes on easy delivering gentle yet long-lasting hydration. A radiant, luminous complexion is in your future with Oxygen Botanicals Night Cream-Normal to Dry Skin. Say goodbye to dry flaky skin with Oxygen Botanicals Night Cream-Normal to Dry Skin. Bathe your skin in intense hydration that reaches deep within the dermis of your skin while nourishing your skin with vitamins and nutrients. Your skin emerges radiant; soothed, healed and pampered by amazing ingredients meant to restore and revitalize dehydrated tired skin. Begin with clean skin. Follow with a toner and skin serum, if desired. 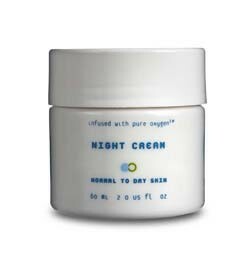 Apply Oxygen Botanicals Night Cream-Normal to Dry Skin in a thin layer to your face, neck, and decolletage. Allow complete absorption of the cream. For an intense boost in hydration apply Oxygen Botanicals Hyaluronic Hydrating Gel after Oxygen Botanicals Night Cream-Normal to Dry. For best results use this cream every night before bed. Continued use will help soothe and lubricate dehydrated skin.